Walk across the street with your fishing poles and remember how it was when you caught your first fish. This 2 bedroom 2 full bath log cabin has healthy doses of wooded seclusion, pond view from front of the cabin and country comforts. As you step through the front door, you will enter into the fully equipped kitchen and living room with gas fireplace and cable TV with a DVD/VCR. Enjoy the wooded view from the screened in deck while sitting in the hot tub or play a game of checkers on the patio table to help make your stay a genuine retreat. The main level bedroom offers you a King size bed with Jacuzzi tub and full bath making this cabin equally suited for a romantic getaway. The upper bedroom in the loft also has a King bed, full bath and with its own TV serves as a separate guest room. There is no need to pack a lot, with a washer & dryer on site. The homes log design will charm you from the moment you arrive, while the rest of the world fades away. It rained the entire stay. The views would be awesome without the rain and very close to lots of entertainment and restaurants. Would recommend!!!! Overall, not too bad, but could use some improvement. The cabin itself is nice. The view from the loft, and porch are very nice. The water system could really use some type of filtration system in it. The water heater is not large enough to allow use of the Jacuzzi tub, unless you like to bath in cool water. My wife used the tub anyway, just did not fill it enough to turn on the pump. She said it looked like she was bathing in chocolate milk. Also the heating system works well, but the lower bedroom gets very hot if you don't leave the door open. My adult son slept on the sleeper sofa, and said it was very uncomfortable. There is no wifi. Okay so this review seems mostly negative , but if you don't plan to use a Jacuzzi tub, or need wifi, and only need two beds, this is a nice enough cabin. We enjoyed the Fisherman’s View cabin. It has two large bedrooms, both with a king size bed. Living room with gas fireplace. Full kitchen, two full bathrooms. It also has nice views, hot tub and swing with a screened in back porch. 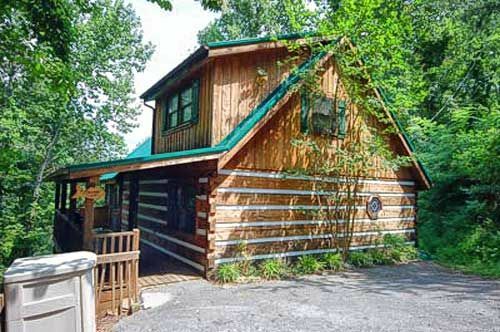 This cabin is also conveniently located to Pigeon Forge. It was a nice stay for my husband, daughter, son-in-law and I.